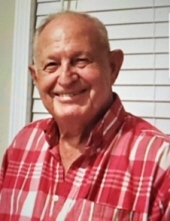 Bobby L. Hester, age 78 of Carrollton, passed away April 1, 2019. He was born July 28, 1940 in Pine Mountain, Georgia, son of the late A.D. “Adolphus” Hester and Lettie Myrtle Collins Hester. He retired from Douglas and Lomason Company after more than 30 years of service where he held a position as a machine operator in quality control. He attended Shiloh Primitive Baptist Church. He was a great man of honor and integrity and high morals. He loved his wife and family dearly. He had many great friends and never met a stranger. He was a popular man about town and was loved by the community and always had a smile on his face. Everyone should aspire to be like him. He was a man of faith and character and was loved dearly by his church family. He had such a generous spirit and was always so thoughtful and giving. He loved to cook for his family and church, in his retirement he cut grass and made many friends. We are proud and honored to call this great honorable man, husband and daddy. We will miss you greatly, but we will see you again in Heaven. In addition to his parents, he is preceded in death by sisters, Rachel Robinson and Lavonia “Honey” West; and brother, O.B. Hester. He is survived by his wife of 60 years, Margaret Robinson Hester of Carrollton; his children, Beverly Hester of Carrollton, Teresa Hester Denney (Jerry) of Saluda, S.C. formerly of Carrollton, Bobby Dale Hester of Fruithurst, AL, Robby Lee Hester (Ashley) of Carrollton, and Yvonne Hester of Carrollton; brother, Mabry “Pop” Hester (Susie) of Chesapeake, VA; eight grandchildren, and two great grandchildren. Funeral service will be conducted Saturday, April 6, 2019 at 2:00 PM from Shiloh Primitive Baptist Church with Elder Tommy Patterson, Elder Dave Chandler, and Rev. Jerry Denney officiating. Interment will follow in the church cemetery with Rev. Pete Collins performing graveside service. The following gentlemen will serve as pallbearers: Mitchell Denney, Josh Hester, Cody Hester, Rick Vickers, Richie Moran, and Keith Hudgins. The family will receive friends Friday, April 05, 2019 at Martin & Hightower Heritage Chapel from 5:00 PM until 8:00 PM. Messages of condolences can be sent to the family at www.martin-hightower.com . To send flowers or a remembrance gift to the family of Bobby L. Hester, please visit our Tribute Store. "Email Address" would like to share the life celebration of Bobby L. Hester. Click on the "link" to go to share a favorite memory or leave a condolence message for the family.